I’ve grown quite addicted to Metropolitan Market’s banana pudding. It feels like every weekend I’m finding a reason to pick up a delicious cup. But at $4 a pop for a small serving, I couldn’t keep it up. I decided to experiment with replicating the recipe at home. I studied the ingredient list: pudding mix, vanilla wafers, bananas, heavy cream, and the secret ingredient – sweetened condensed milk. 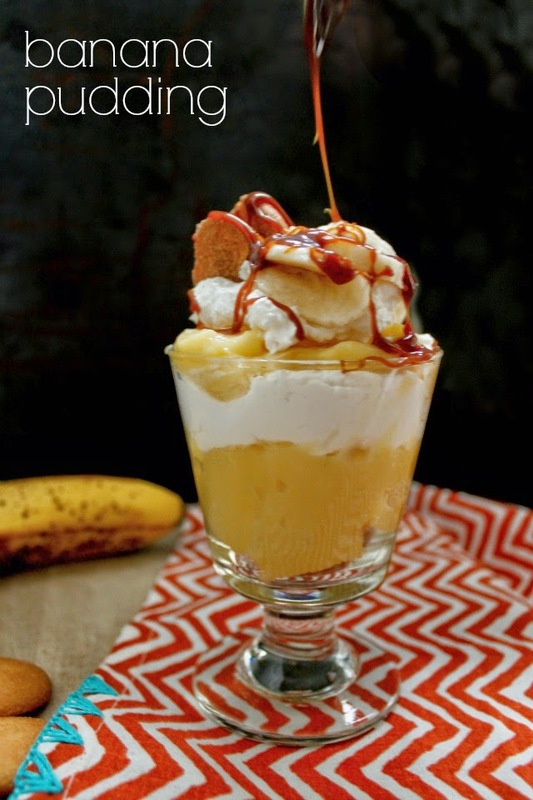 It tastes just like at the store, a rich, creamy banana pudding. My taste buds are so excited that I unlocked the secret, my waist line, not so much. In large bowl, combine sweetened condensed milk and water. Add banana pudding mix; beat until well blended. In a large bowl, beat heavy whipping cream until stiff. Add sugar and vanilla to taste. Fold in half of the whipped and add sliced bananas. Layer pudding mix, whipped cream and vanilla wafers in a serving dish. 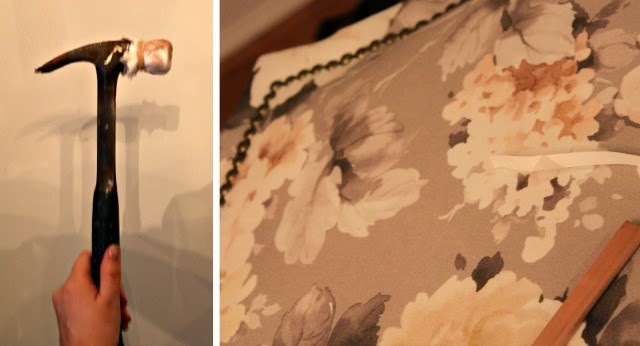 We now have a few key elements in place in our bedroom, which means it’s reveal time. Our bedroom is tiny at about 10′ by 10′. It’s big enough for a queen sized bed and small nightstands, that’s about it, folks. In my opinion, the bedroom only needs to function for two things, sleeping and dressing. Well our bedroom fits a queen size bed perfectly, and the closet (almost as big as the bedroom!) has plenty of room for clothes, storage and dressing. 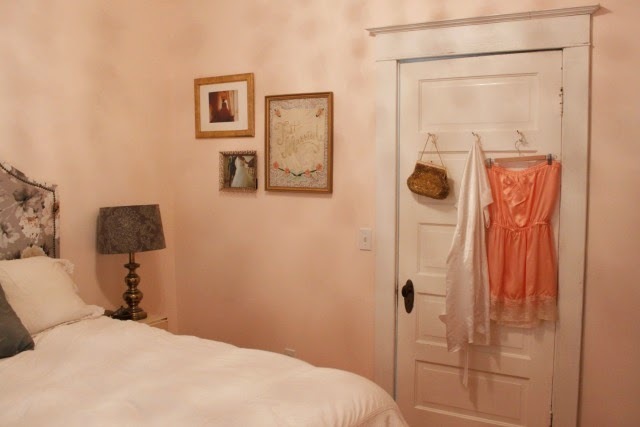 The wall color is Ecru by Benjamin Moore – and it’s just perfect. It can appear white, but has a pretty peach tint that makes you feel all cozy and cocoon like. 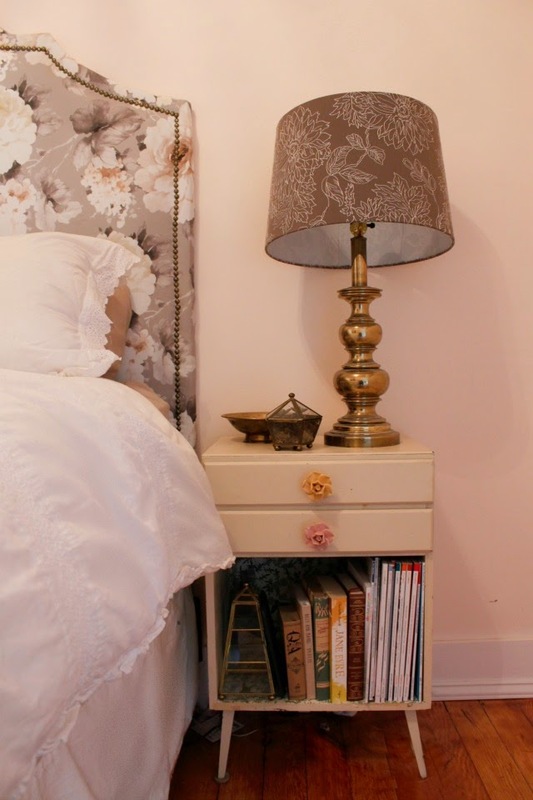 The brass lamp bases were a garage sale find last summer ($3 for the pair!). This season we will be hunting for matching nightstands, with drawers for storage, and I’d love to find an inexpensive platform bed with more storage underneath. I wouldn’t be opposed to fresh new bedding either, or at least a new throw pillow, or two. Our curtains were another smart move (if I do say so). 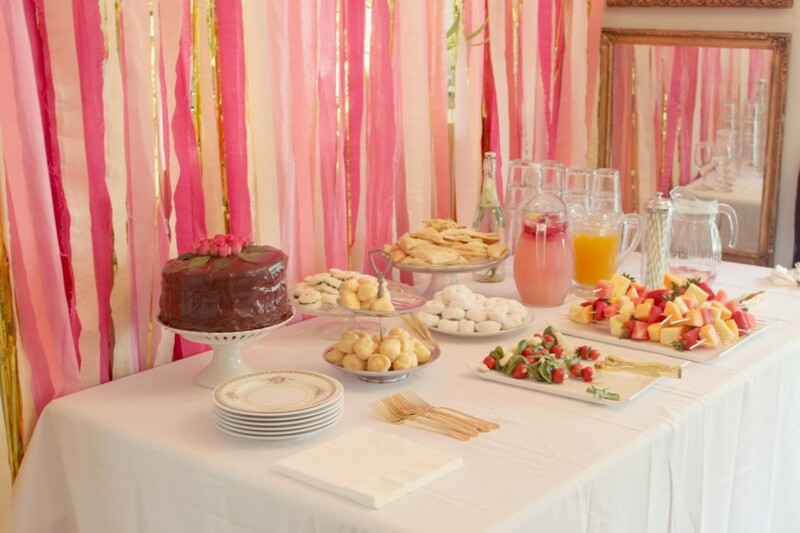 We bought the fabric to use as tablecloths for my bridal shower, much like the headboard fabric. Love it when things can be used twice! Like most of our projects in our house, our headboard has been on our to-do list for months, and we finally finished it. 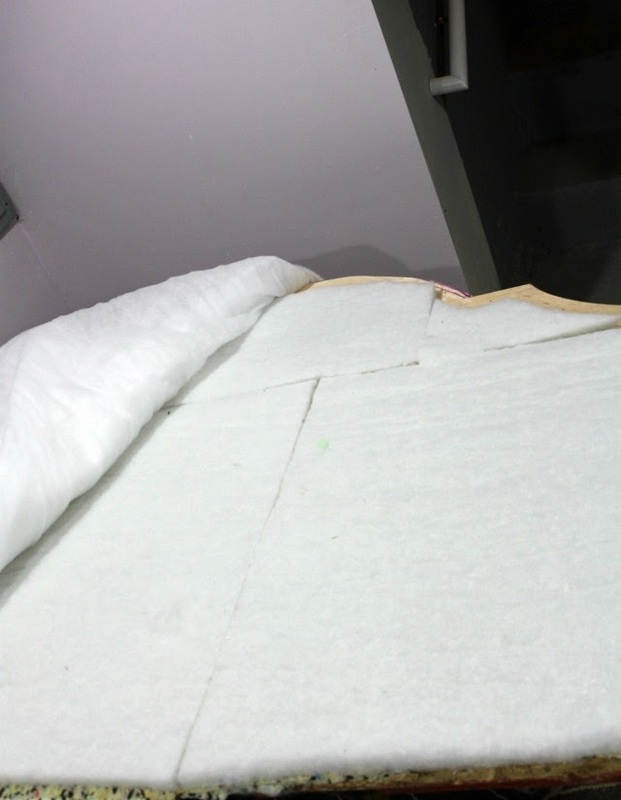 We actually did the first cuts back in October, but lost steam before we got any fabric on it. I’m not going to do a tutorial, because, let’s face it, there’s a zillion of these tutorials out there. 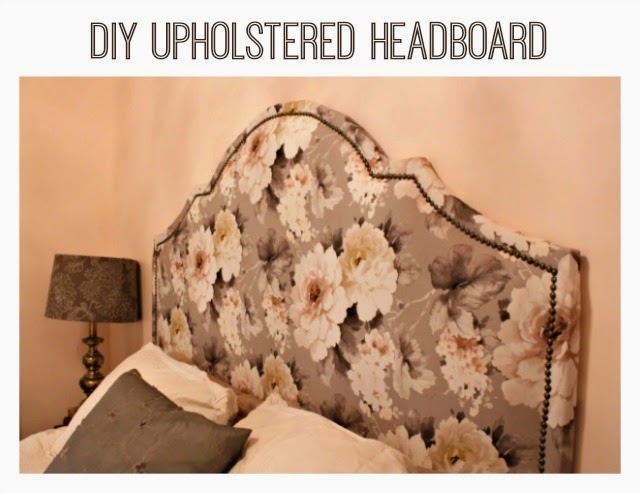 In fact, I don’t know who would buy an upholstered headboard, when you can make one so inexpensively. Hundreds of dollars were saved, people. 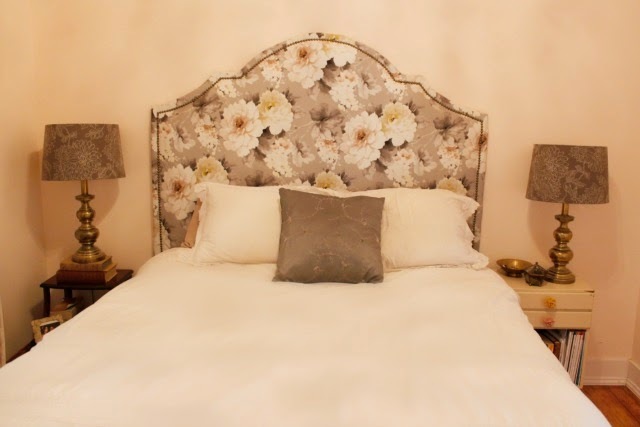 The shape was inspired by this bed on Glitter Guide. I’m really happy with the end result, but the shape drove us mad. We are apparently really bad at geometry and we didn’t have a compass on hand. We ended up re-cutting and trimming here and there a few times to get it symmetrical. 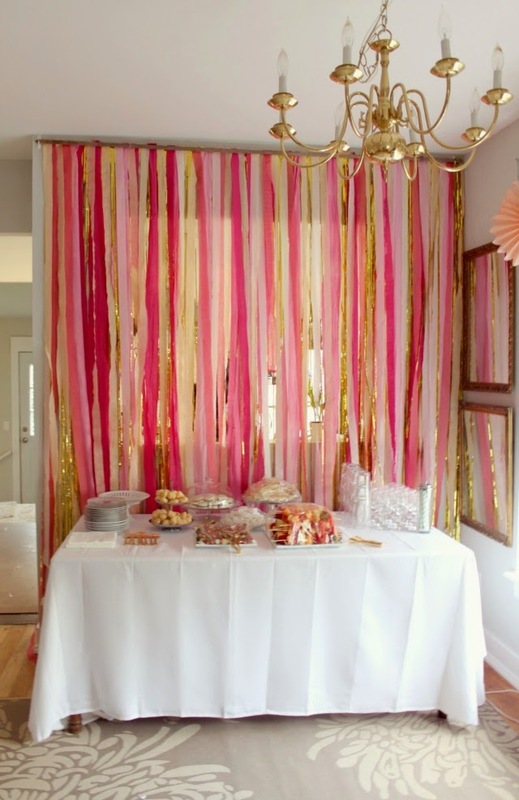 The fabric was originally bought to use as tablecloths at my bridal shower. 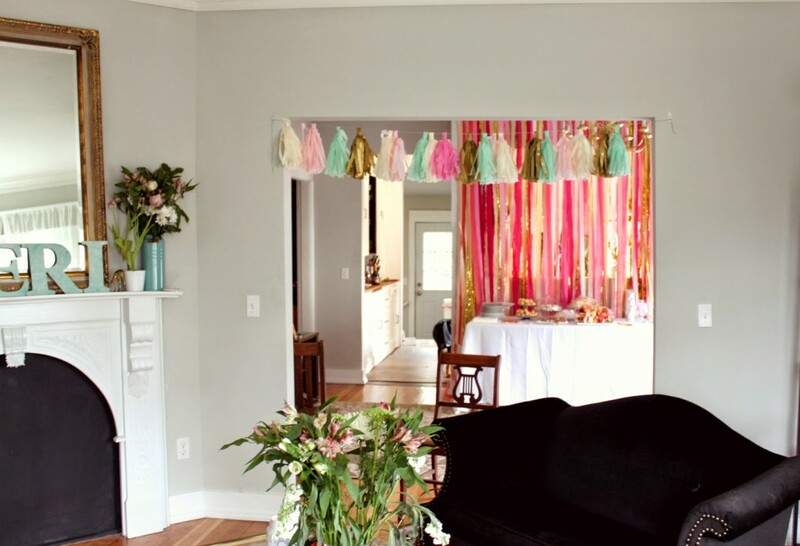 Not a coincidence, if you’re buying fabric for a one-time-only event, try to think of ways you can reuse it. I love the colors, it fits perfectly with the soft peach color on our wall and the grey adds a bit of masculinity to it, maybe? I may be fooling myself there. One of our roadblocks in getting this project to the finish line was a disagreement in how best to add a thick edge. I was dead-set on using Kristin’s method from the Hunted Interior. My dad, who has a construction background, thought wrapping fabric around a thin piece of bendable wood and attaching would work. However, you need wood trim in order to use nail head trim, which was the plan. Once that was decided, I just had to convince Billy to do the extra legwork in cutting out the headboard shape for what would be the second time. 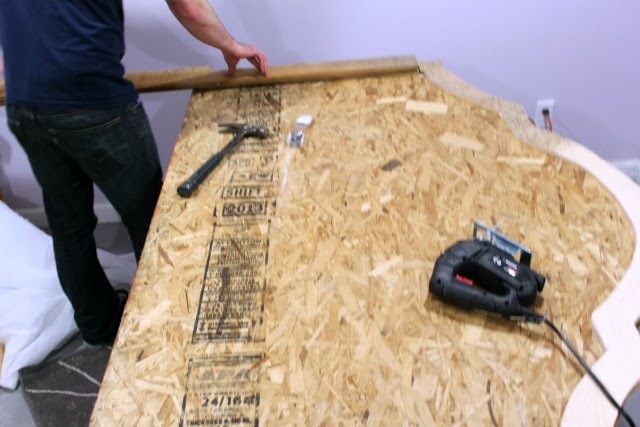 If we were to do this again, we’d attach the wood first and make the trickier cuts only once. And finally, we wrapped it in fabric and stapled it. (sorry no photos). And measured the line for nailhead trim. 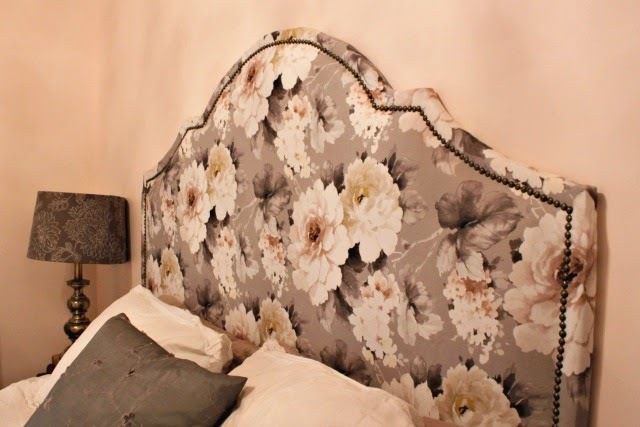 There is a specific hammer that you’re suppose to use for nailhead trim, but for this one-time project, I didn’t feel like spending the money. 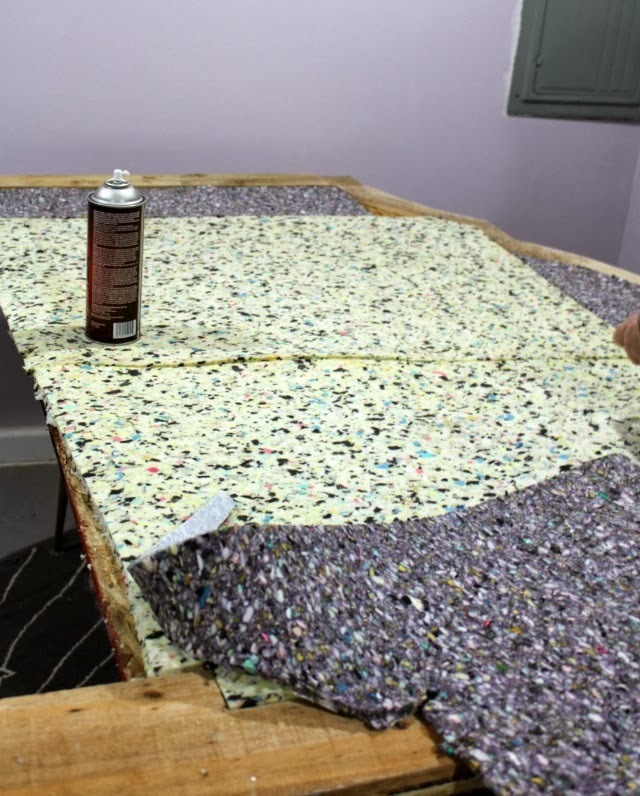 So, we wrapped our hammer in some of the scrap fabric – and it worked great! 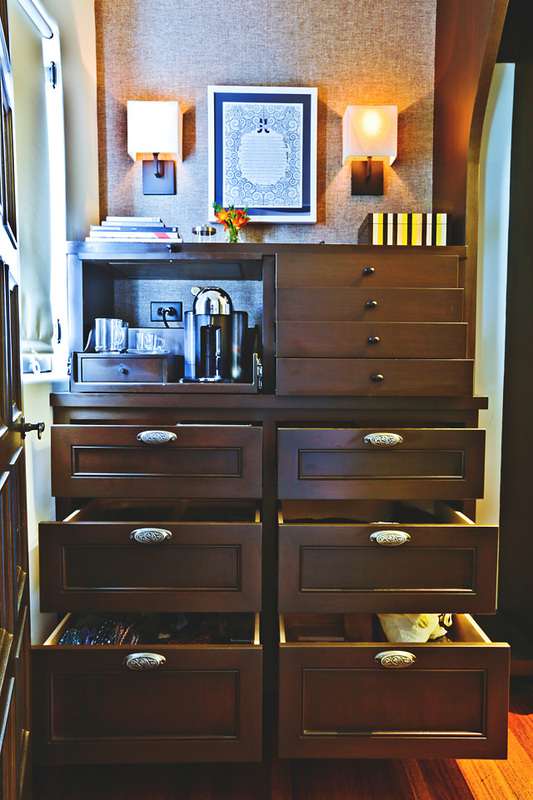 A note on the nailhead trim, we ordered several trim kits, but the colors were never right. First I ordered Dritz in silver, but we have a lot of brass in the room, and I wanted to pick up those metal tones. So, we ordered the Dritz nailhead in brass – the ‘nails’ were the perfect color, but the strips were a bright brass, like gold. That would not work! I finally found some in a “french natural” and it was exactly what we were looking for. 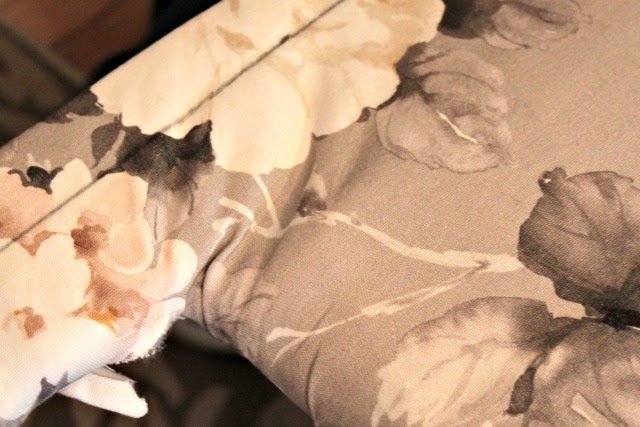 Does’t the fabric look great with our paint color? 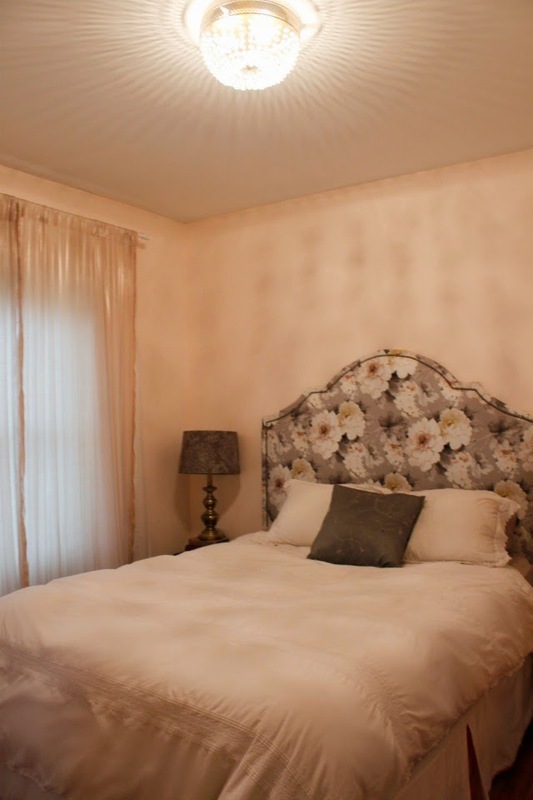 I’ll be sharing some more bedroom pictures with you all on Wednesday, stay tuned! 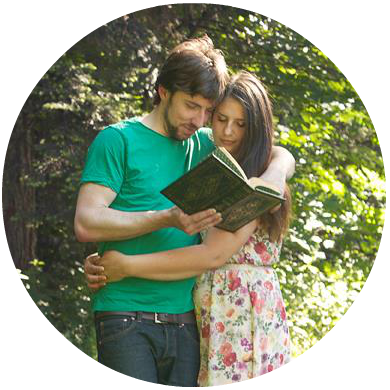 One of my biggest joys in life is bringing loved ones together for an intimate affair. 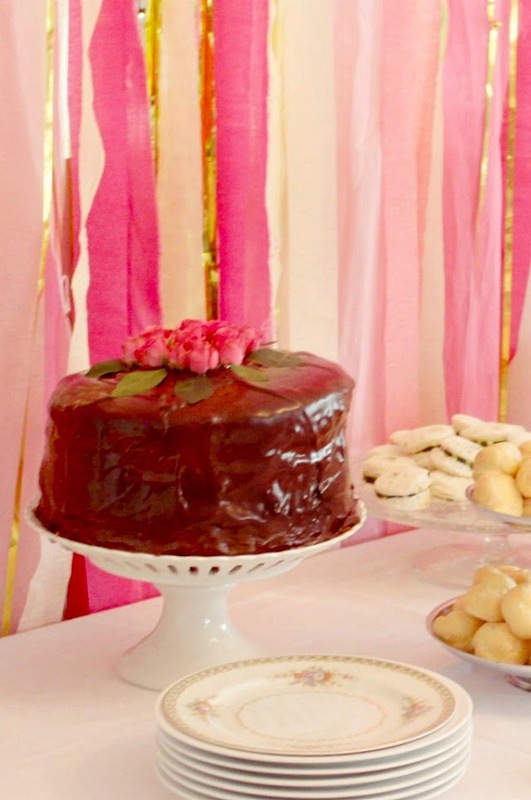 I love pulling out my serving pieces and creating an atmosphere for celebration. 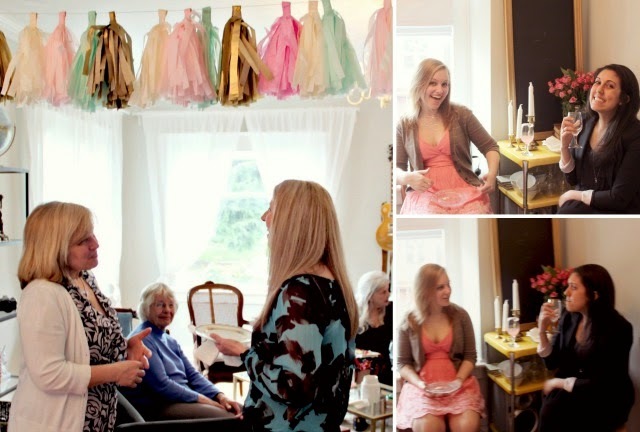 A few weekends ago I was honored to host my sister-in-law-to-be’s bridal shower. Her wedding is seashore inspired (the ceremony will be at a local lighthouse) and I wanted to do something distinctly feminine that alluded to the wedding inspiration without infringing on the wedding theme. I thought an ombre / watercolor effect would be the perfect nod to the wedding palette. I then interspersed gold and mint elements to tone down the pink. We have a pass-through from our dining room to our kitchen, but I knew the kitchen would be a mess with prep work for the party. 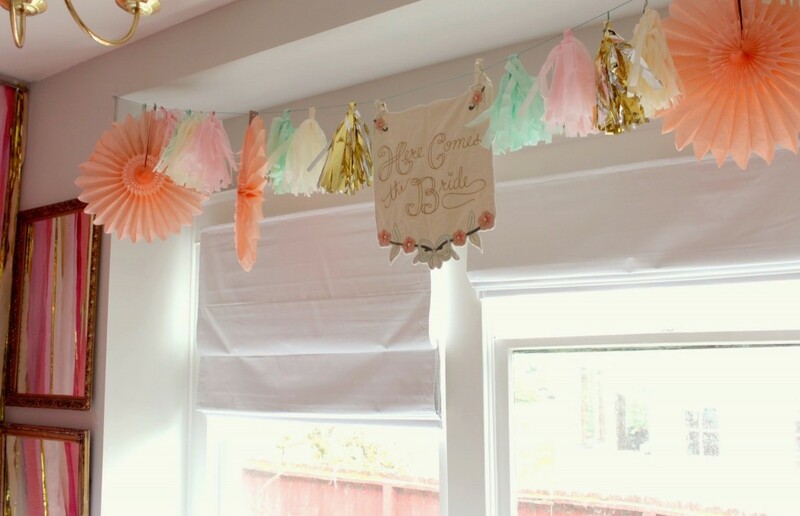 To hide it and create a focal point, we crafted a crepe paper backdrop with layers of crepe paper streamers, died linen strips and a gold fringe. I think it turned out dynamite, although a little more pink than I had anticipated!